James Tarkowski is determined to add a Europa League appearance to his resume after getting his first taste of international football. The Clarets centre back earned his first England cap in the 1-1 draw against Italy at Wembley Stadium one week ago with his performance giving Gareth Southgate some food for thought ahead of this summer’s World Cup in Russia. And with Burnley still sitting in seventh in the Premier League, with just seven games remaining, the odds of landing a European place continue to slide in their favour. Should Sean Dyche’s side successfully fend off Leicester City, who they entertain at Turf Moor later in the month, and preserve their position in the table then they would require Spurs, Manchester United or Chelsea to win the FA Cup. “We’re just trying to continue what we’re doing, we’re not putting a marker out for where we want to be at the end of the season,” said Tarkowski, who signed a new long term contract at Turf Moor in January. “We’ve got to keep trying to win games, keep performing how we are and if we’re in those spots at the end of the season then brilliant. “Nobody would have expected at the start of the season that we’d be in the top seven, we’ve got to keep pushing forward. 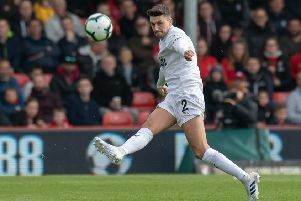 The ultimate dream for the defender would be to make the final squad for the Three Lions and contribute in their Group G campaign having already helped Burnley in to the First Qualifying round of the Europa League, won by Manchester United last season. “You’d have to ask the bookies [for the odds] but I think it would be quite high,” he said. “I’ve really enjoyed it and the most important thing in football is to enjoy yourself and hopefully get the rewards from your hard work and dedication that you put into the game. “This season has been one of those seasons that’s paid me back a little bit and it’s nice to see the rewards I’ve been getting but I don’t want to stop here, there’s a lot of work still to be done. “I think that’s the way I’d like it to finish but I’m not banking on anything.